Ideal for diluting oil and enamel based paints, alkyd varnishes, and solvent based primers, preventing bubble formations due to its anti foam composition. Use it to clean paint rollers and brushes. Use it to thoroughly clean metal surfaces before priming or painting them. 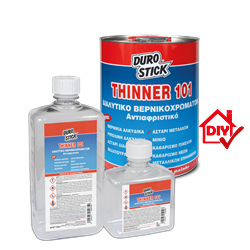 50 -100ml THINNER 101 per 1lt of enamel paint.